I’ve got a storm of baked goods comin’ your way. I would apologize for not posting healthier foods or main dishes, but I’m really not sorry. If you want someone to blame, you can start with Mothers’ Day. And then birthdays. Because all those occasions require baked goods. And when they all fall within a few days of each other… well, I end up pumping out a lot of goodies from my tiny kitchen. Preheat oven to 350°F. Butter an 8.5″ loaf pan with butter. Line the bottom with parchment paper and butter and flour the pan. In a large bowl, beat together yogurt, 1 cup sugar, eggs, lemon zest, and vanilla. Slowly pour dry ingredients into wet ingredients and stir gently to combine. Mix in canola oil until combined. Pour batter into prepared loaf pan and bake in preheated oven for 45 – 50 minutes, or until a toothpick inserted into the center comes out clean. Meanwhile, combine remaining 1/3 cup sugar and 1/3 cup lemon juice in a small pan. Cook over low heat, stirring frequently, until sugar has dissolved. Set aside. When cake is done, let cool in pan for 10 minutes before placing on a wire rack over a sheet pan . Using a toothpick, pierce top of cake several times. 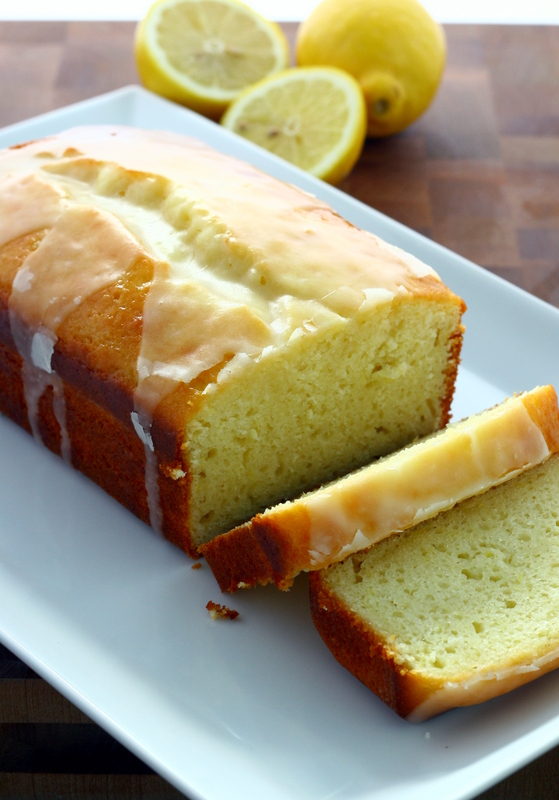 Pour lemon-sugar syrup over warm cake. Allow cake to cool completely. To make the glaze: in a small bowl combine lemon juice and confectioners’ sugar and mix until smooth. Pour over cake. Categories: Breakfast & Brunch, Cakes & Cupcakes, Dessert | Tags: cake, dessert, fruit, lemon, quick and easy | Permalink. This is a perfect tea dish on a lazy spring day! I’ve got a ton of lemons from our tree and was just looking for something like this. Thank you! Just made it cake and the whole family loved it!! It is a keeper. I did add some poppyseeds as we love that little crunch. And I totally forgot the sugar EEK when it was in the oven for a bit I realized I forgot the sugar. So I just added a another third cup to the syrup and added another tbs of lemon juice hoping the cake would soak it all up, and it did!! The cake was sweet enough ( I am a sweet tooth) and I even think I will skip the sugar next time too. Thank you for sharing this recipe.